Yw 96 English Studies 77: 9780631212935 Hardcover - LIMEROCK BOOKS INC.
Now combined in a new series with The Year's Work in Critical and Cultural Theory, The Year's Work in English Studies, edited by Peter Kitson, is an annual narrative bibliography which aims to cover all work of quality in English Studies for a given year. 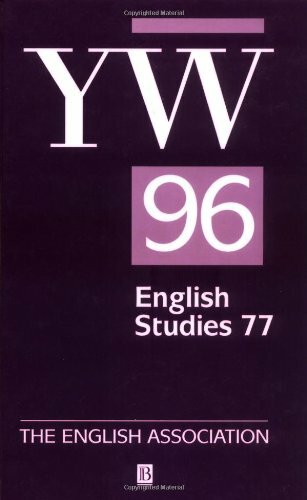 Like its sister volume, YWCCT 6, YWES 77 covers work published in 1996.<br /> <br /> It contains:<br /> <br /> *Critical notices of some 1100 books<br /> <br /> * Extensive coverage of English Language, American Literature, New Literatures in English and English Literature<br /> <br /> * Coverage of specialist periodicals (including volume numbers for journals and pagination of all articles cited)<br /> <br /> * Comprehensive indexing by critic, author and subject<br /> <br /> * Bibliographical endnotes for each chapter. <b>Peter J. Kitson</b> is Lecturer in English, specializing in Romantic literature, at the University of Wales Bangor. He is editor of <i>Romantic Criticism 1800-1825</i> (1989) and <i>Coleridge, Keats and Shelley</i> (1995) and co-editor with T. N. Corns of <i>Coleridge and the Armory of the Human Mind</i> (Frank Cass, 1990).